Everyone has a favorite game, and, with that, the desire for that game to deliver more than just what’s inside the box. That’s where expansions come in. Some love them, some ignore them, but no matter the case they are an existing and sometimes-essential part of the board game hobby. Since they are so prevalent we thought it would be a good idea to discuss the best, brightest and downright bad that we’ve experienced. And, yes, we’ve experienced a lot. The State of Games Survey Contest! 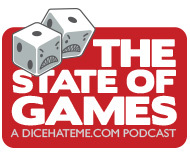 You can win up to $210 worth of gift certificates and Dice Hate Me Games products! All you have to do is give us your feedback! Please be honest in your feedback, as we want this to be the best podcast it can be. This is your opportunity to shape the future of The State of Games. • Grand prize: $50 gift certificate to Meeple Source, $50 gift certificate to Miniature Market, a complete set of Dice Hate Me Games Rabbit 54-card games, and a copy of Brew Crafters! • Second prize: $25 gift certificate to Meeple Source and your choice of a complete set of Rabbit card games or a copy of Brew Crafters! • Three runner-up prizes: $25 gift certificate to Meeple Source! This episode gave me pause to consider the place of several expansions in my collection. I agree with TC that Coup: Reformation is an essential expansion when playing with 6 or more, not only because it allows for more players but because it adds focus to people’s attacks and challenges. The larger cards in Ticket to Ride’s 1910 makes it an essential pick, but it’s also nice having the additional routes which expand upon those found in the original game; I just wish they’d have included the larger format Mystery Train expansion character cards, too. One more essential I didn’t hear you mention is the Council of Verona Poison Expansion. I don’t like playing Council of Verona without it as it adds such a thematic addition which really improves the play of the base game. I do enjoy the variety of choices many expansions provide such as those for Carcassonne, The Duke and Smallworld (also good call there, Chris, on the Cosmic Encounter expansions). One expansion I enjoy even moreso than the variety it brings is Hansa Teutonica: Britannia since it adds another layer of strategy to the game with its regional presence scoring. As for my favorite expansion, I really enjoy Omen: A Reign of War’s several little expansions which add small twists to the game. The one expansion I wish I could get my hands on right now is an English printing of Kaispeicher for Feld’s The Speicherstadt. One day, one day. Good show everyone! Thanks for the chance to win some nice prizes. My survey is submitted. I am an impulsive completionist. I def. get excited about expansions, which account for the most unopened boxes on my shelves. I have to say that when I had runebound, I had every expansion. Regret selling that one now as I didn’t play hardly any of the small ones. Miss that game! I do disagree that expansions should be “all in” meaning non-modular a la the 7 wonders argument. I don’t even play with both parts of Babel as I find it bogs the game. I used to think that expansions should all add on top of each other, but as I’ve matured I value timeliness and elegance over volume. Arkham horror is a great example of you can play with all expansions, but prob. Shouldn’t as it waters down the flow and elegance of the game. It becomes bloated and makes it (even) harder to form a cohesive narrative of your adventure. And there is a turning point where added length becomes an intrusion into the experience and subtracts for the fun that our hobby is about. I’ve actually come to respect and love expansions that are modular in their core nature- a bunch of mini-expansions from which the players may pick and choose to Taylor their experience. The best example (and my fav.) is Tuscany expansion for Viticulture. I feel like I got a huge expansion and def. my money’s worth out of box that I haven’t even half explored. So many modules and you aren’t meant to play with all at once. This makes me feel I won’t NEED another expansion to this game as it may take me years to play with the different combinations of modules + base. I would actually love to see more expansions come this way- perhaps one for brew crafters (hint hint. The new merchants and marauders expansion does this well too! There are 2 types of expansions and it really depends on the game which is better. They are 1) more of the same and 2) add to/ shake up the mechanics. Many games are so good you just want more of the same and the mechanics don’t need to be messed around with. You may add a special ability or 2 but nothing changes it fundamentally. 2 great examples that have BOTH of these approaches are Sentinels of the Multiverse and Baseball Highlights 2045. For both, more cards (heroes, villains, players, etc… Are welcome because the core game is so good! Yet both games also have expansions that change the mechanics (villain teams for Sentinels and rally/coaches for baseball). I’ll be honest and say in both of these cases I haven’t played with the new mechanics as I love the core ones so much! I didn’t NEED things shaken up. Ones that did: core worlds and eminent domain for example. See next paragraph. So what are my must-have expansions for play? I will not play core worlds nor eminent domain without their first expansion. No turning back on those because both games were only good IMHO when released. The expansions have made both of those games excellent! Suburbia didn’t need things shaken up, but I won’t play without the extra buildings now (boarders I might leave out). I refuse to play pandemic without the cure expansion as it took the most non-thematic part of pandemic (discard cards to cure a disease, and added a mini game to curing diseases (and the irony is in the end you are still discarding the same number of cards to cure a disease but it is actually thematic now!). Great episode and great topic! Hey just a general comment to your podcast (which I love). Could you stop saying “this game” so much, and instead say the name of the game again? I listen while driving and often I have to blank out for a few seconds and miss which game you’re talking about. It would be great if you could throw the name of the game into the conversation more often so that I know what you’re talking about. Carey, I just wanted to follow up with you that we have received similar comments about when we discuss a game, and we are trying to do better. You should notice a difference on the latest episode, but please let us know how we are doing. Your feedback is always appreciated. Thanks for listening.